Children who have social, emotional or learning challenges hear the word “therapy” and run for cover. 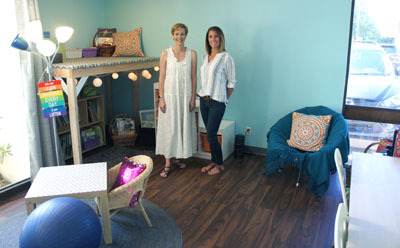 Artplay founder Liz Tomko, left, and Elizabeth Rowley of The Art of Learning, stand inside the new tutoring space offered inside the expanded Artplay center, located at 1130 E. Missouri Ave. (photo by Teri Carnicelli). Oftentimes, so do their parents. But therapy isn’t the dry, intimidating and uncomfortable process it used to be—particularly when it comes to children. Just ask Liz Tomko, founder of Artplay LLC, which recently more than doubled it space at 1130 E. Missouri Ave.
Tutoring services are available Tuesday through Saturday, for individual, siblings or small groups for those who also need additional socialization skills. Provided by Elizabeth Rowley of The Art of Learning (www.theartoflearningaz.com), children in pre-kindergarten through eighth grade have a comfortable space to work in with their choice of seating areas. Rowley keeps it structured but fun and low-stress. Tweens and teens have the need to belong, so Artplay has created a group to help align these youth with kind and supportive peers in order to build the social skills they need during this important developmental stage of life. Becky Goudy uses social activities and meaningful art-making to teach this dynamic age group (11-16) ways to socialize successfully. The group meets every-other Monday at 6 p.m. But the core continues to be art therapy for children, either individually or in sibling groups. Tomko emphasizes the space is a non-clinical environment, with soothing colors, stuffed animals and other sensory-friendly toys, as well as “safe spaces” for children who are having episodes. Therapy is devised based on the individual child’s needs and level of emotional/social development. If needed, other family members might participate in sessions if the issues are directly related to the relationships within the family itself. Otherwise, parents are given feedback after every session, so that they can continue the work at home and also share strategies with the child’s school. Parents generally stay on site during therapy sessions. Tomko has a comfortable waiting room with books, a desk for those who need to work on a laptop, and even an electric massage chair. With its expansion, Artplay gained a space that was perfect to turn into a small kitchen. Tomko introduced a periodic kids cooking class for virtually any age, as no real “cooking” is done (though there is a stove/oven in the kitchen). In a sensory cooking class, kids can learn the magic of transforming ingredients into delicious food with their hands. They have squished avocados and squeezed limes to make their own batch of guacamole, and made a healthy chickpea spread by smashing chickpeas with a potato masher then adding a few drops of healthy oils. Tomko says that many children who have social and emotional issues also tend to have food issues—meaning, they often reject food and eat very little. But she says that studies have shown that children who take part in making food are more likely to try it, as they have touched it and smelled it for some time before it is ready, which engages their senses and might also pique their hunger. For families with children identified in the Autism spectrum, specialized service is available at Artplay through Harmony Behavioral. Call for more information. Currently Artplay and its various programs serve approximately 150 children. With the recent expansion, there is room for many more. “We are excited that we can help kids and parents with the most qualified, hand-selected, child-centric set of professionals around,” Tomko says. For more information, call 602-329-1347 or visit www.artplayhealing.com.